April felt a little bit like crashing back down to earth. My Cowgirls Vs Cthonimon Kickstarter fizzling out was disappointing, especially after putting so much time into it. However, in hindsight, I can see where I went wrong with the campaign, and for future Kickstarters (and when I eventually relaunch Cowgirls) I will be better prepared. I am confident I can make Kickstarter really work for me – once the campaign is handled correctly. I thought it might be useful for anyone reading this (who is considering starting a campaign) to mention some of the things that stood out for me. The following info and observations may help your first campaign be more successful than mine. Numbers – it was the numbers that really threw me off on Kickstarter. I had assumed (so very wrongly) that just by being up on Kickstarter (with a Greenlight submission running in parallel) I would see some reasonable eyeballs on the project. The reality however was very different. The campaign flatlined around the halfway mark, so I pulled the plug with 1 week to go, but for the first 3 weeks of the campaign, the promo video was watched just 825 times. That’s right – just eight hundred and twenty five views. And that was with a Greenlight submission ticking along. The lesson learned here is – Kickstarter alone does not supply near enough visibility for a Video Game project to succeed. Project We love – I have seen others whose Kickstarters did not do well lament the fact that they never got a “Project We love” tag on their project. That tag could have made all the difference, right? More visibility, more pledges, greater success? In my experience (having been tagged after I uploaded an improved promo video) being tagged actually made very little difference. So don’t fret about whether or not you become a “Project We Love”. (Note that I still appreciate that Kickstarter tagged me in this manner, it tells me that they believed in the game itself and felt the page presentation was up to scratch). Competition – when I was running my campaign, there were around 150 or so other Video Game projects live on Kickstarter (149 as I write this). That’s quite a lot of projects directly competing for eyeballs. Not to mention there were many more projects (554 total) under the broader “Games” category that many people would also have been distracted by. Many of the Video Game projects were in a somewhat similar vein to mine too – retro, action RPG, pixel art etc. – which is something else to consider. It’s good to be aware in advance of how much competition you can expect. As a side note, for anyone developing in GameMaker: Studio who is active on the GMC, a handful of those 150 games that were live as I ran my campaign, were also being developed using GameMaker and were advertising on and pulling a few pledges from the GMC at the same time as mine. So bear that in mind. Funding Goal – For Cowgirls I purposely set the funding goal quite low (but not low enough) in expectation that it would be achieved quickly and that I could follow it up with Stretch Goals (all the way up to 20k!) and Backer Bonuses once it was reached. That was a bad idea. For big Kickstarter projects, ran by well known games industry vets, or people with massive social media followings, setting the funding goal high is the right way to go (the only way to go if you’re looking to make a full time gig out of your project). But if you are a small indie, relatively unknown, without a large initial support base, with a small social media presense, and without an advertising campaign, then I suggest you go as low as possible with your Funding Goal. My reasoning here is that you can set a note of positivity early on in your campaign when the Goal is reached in a few short days. 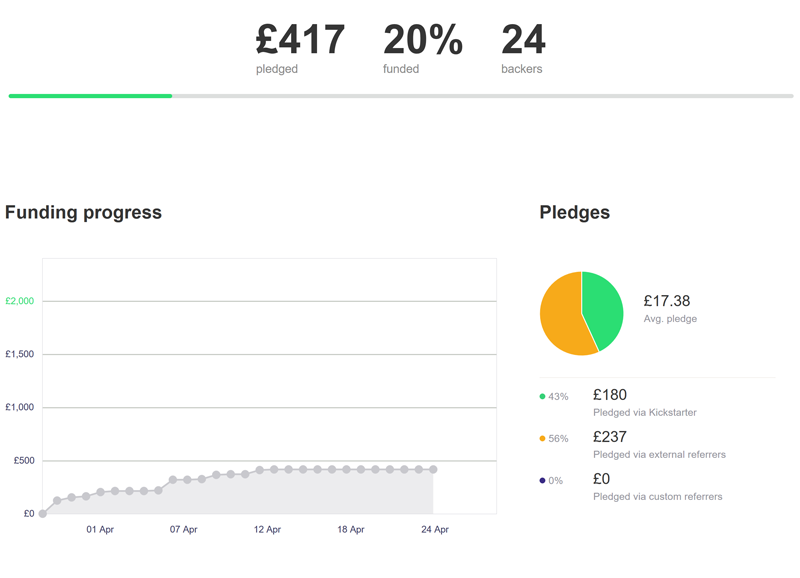 This makes current pledgers happy, gives you something big to post about, and gives any new project viewers more confidence in the game – which makes them more likely to pledge. 1. Have built up a solid base of people interested in the game beforehand. 2. Have a professionally edited promo video that fully demonstrates all features. 3. Don’t launch until the game is far enough along in development. 4. Have a playable demo available from day 1. 5. Have Stretch Goals available from day 1. 6. Prepare all bi-weekly feature info and milestone/ unlock posts beforehand. 7. Build up hype for the campaign on social media beforehand. 8. Cross-promote similar projects via social media. I hope this little post-mortem was useful. Feel free to comment below. I am interested in hearing other people’s opinions on and experiences with Kickstarter. Wow, this has been a crazy busy (and productive) month! 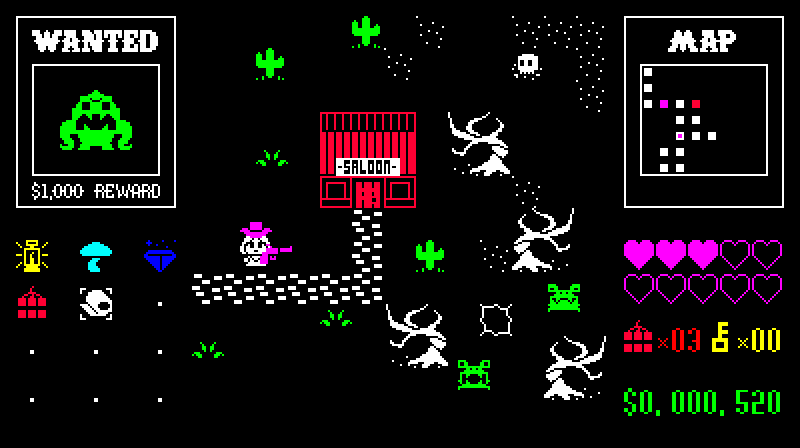 I managed to get the demo of Cowgirls Vs Cthonimon into a reasonably non-buggy, playable Alpha state, finished off all the KickStarter page promo imagery and text, and Jack Oatley is now properly on board the project, rewriting a lot of the code and generally making the source file cleaner and a whole lot easier to deal with. Right now, the Kickstarter project is in a ready to go state. I’m just waiting for the submission process to complete before I can hit launch. Should be live any day now, so to those who have been waiting patiently – the wait is just about over! 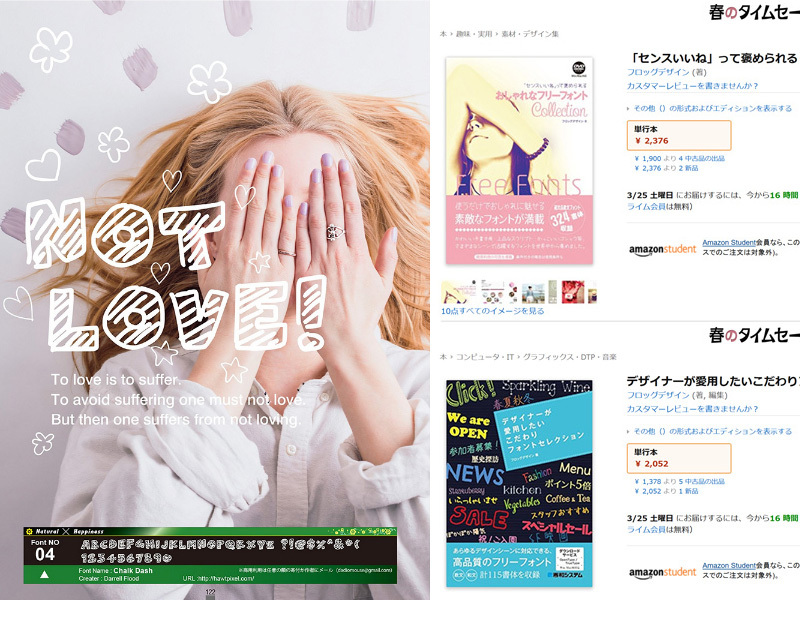 On the font front, my fonts were featured in two Japanese design magazines this month. With “Chalk Dash” being used on a full page splash. It’s a small thing, but every little bit of exposure I can get in Japan is a good thing. 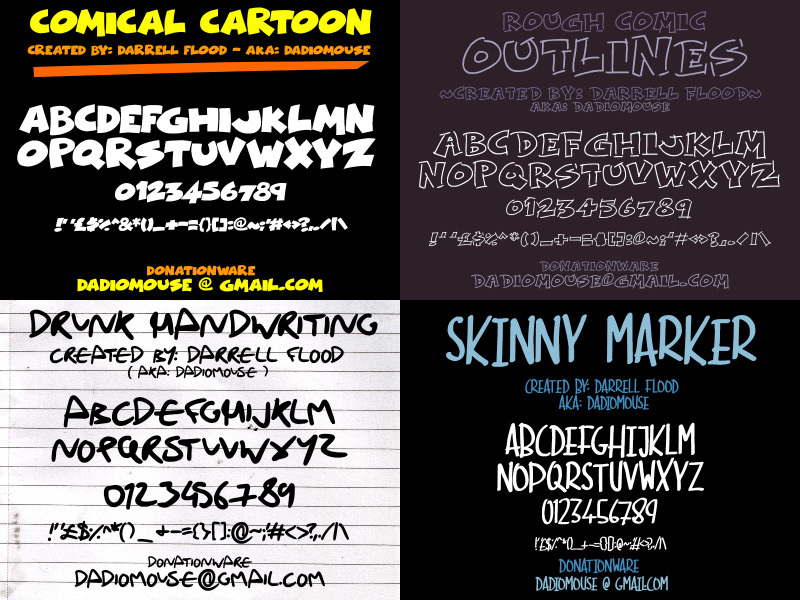 And finally, I created 4 new fonts this month. You can find these under Darrell Flood on dafont and fontspace. I’m starting to feel somewhat burnt out on the hand-drawn fonts at this stage, so next month I think I’ll go back to my roots and crank out a few more angular/ modern/ clean fonts again. February was a good month for Cowgirls Vs Cthonimon. There were many art adjustments to sprites and tiles, and visual effects added that improve player feedback a lot. The UI has also finally been finalized – with everything where it should be. New music tracks and sound effects have been added to improve the mood, that will hopefully give Alpha players a much better idea about how the game will feel in the end. 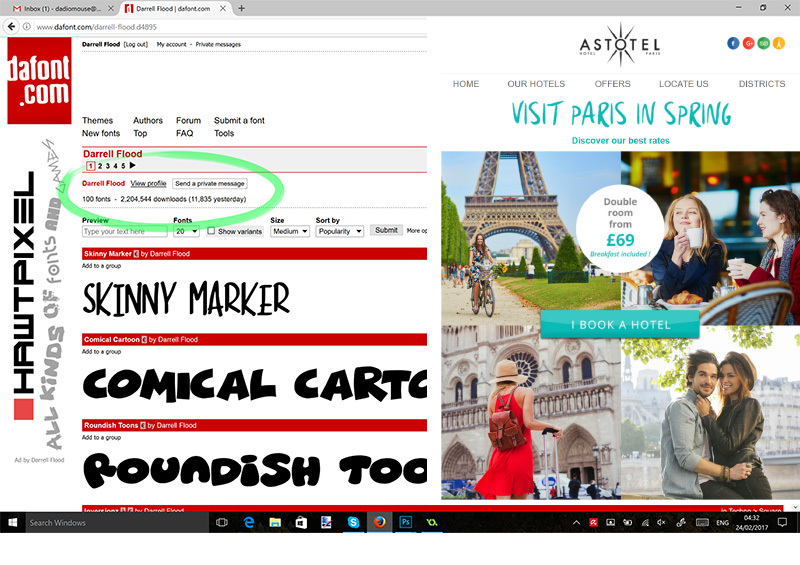 A font of mine was also used in Astotel’s recent advertising campaign – which was neat when I recognised it after it appeared in my inbox. Just one new font for this month. I tried something a little different this time, including a solid color underlay font along with the main hollow font, giving users a clean fast route to “coloring in” their work. 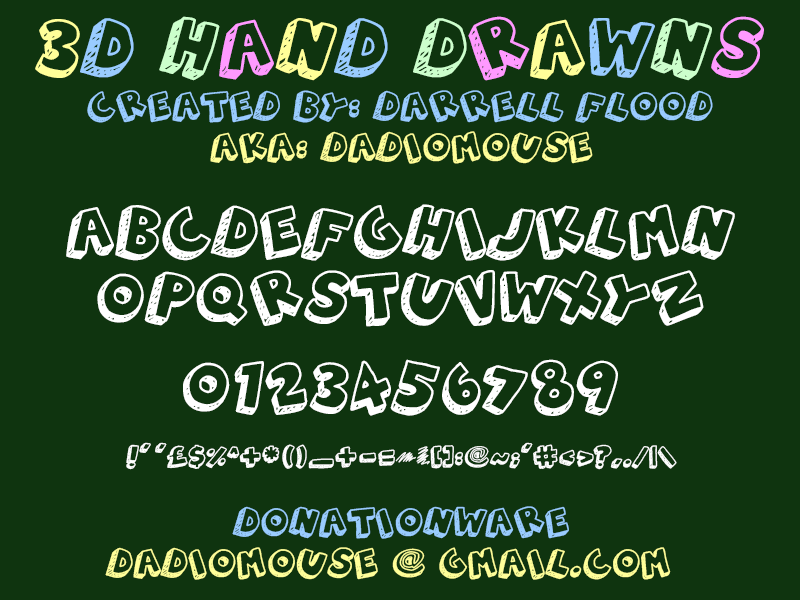 As always, you can find the font under Darrell Flood on dafont. January was an odd month, and a strange start to the year! Mostly spent in Ireland celebrating New Year with family and hopping between fonts and Cowgirls Vs Cthonimon, but ending in Japan (where I plan to live from here on in). Cowgirls is still ticking along nicely, not going as fast as I’d hoped, but I’m confident that paying attention to all the little details will pay off. Font-wise I was a very busy bee this month. I managed to put out 12 new fonts. Some of which I predict will become very popular. You can check ’em all out in the usual place – under Darrell Flood on dafont. Wow! What a crazy year it’s been! Exiting YoYo, going back to being full-time indie, multiple house and country moves, and an insane amount of holidays! (Spain, France, Czech republic). It’s been a mad ride, and a lot of fun, but now with 2017 on the horizon, it’s time to reign in the madness and get focused. December saw a massive ramp up in font production. I managed to get 15 fonts out this month. Very happy with how most of these turned out and it felt good to be back with my Cintiq in Ireland. I really have to ship that over to Japan at some point, it just speeds up the process so much. 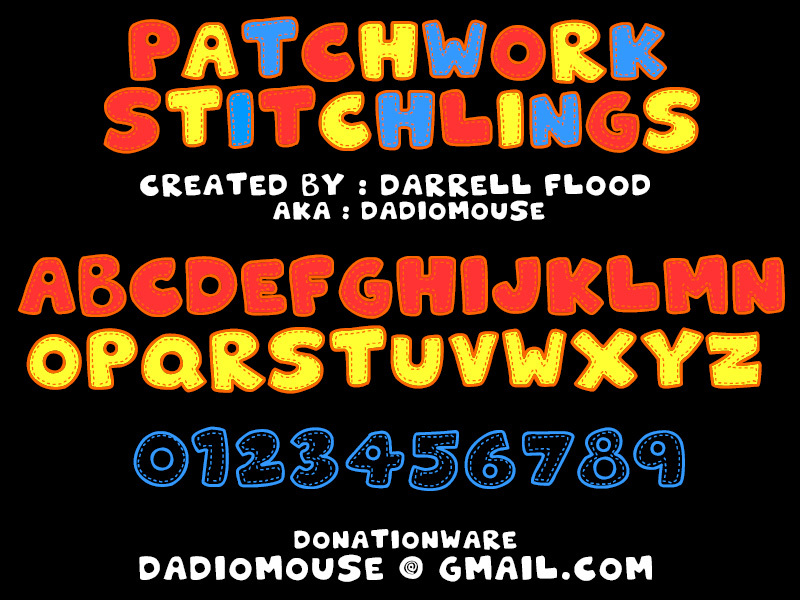 You can find the fonts under Darrell Flood on dafont here. As for Cowgirls, it’s been tough with all the family related shenanigans finding the time to really get stuck into it, but some progress has been made. I’m going to make it my top priority from next month onwards. Cthulhu demands sacrifice! November was a hectic month trying to organise everything for my Japanese residency, packing and shifting around a whole lot of stuff between houses, and trying to get a few fonts out in between. I’m going to stick with this new “Monthly Round Up” format for my posts from now on. My life seems to constantly careen crazily around, so doing this once a month, at the end of every month, should work best to ensure I let everyone know what I’ve been up to in a timely manner. 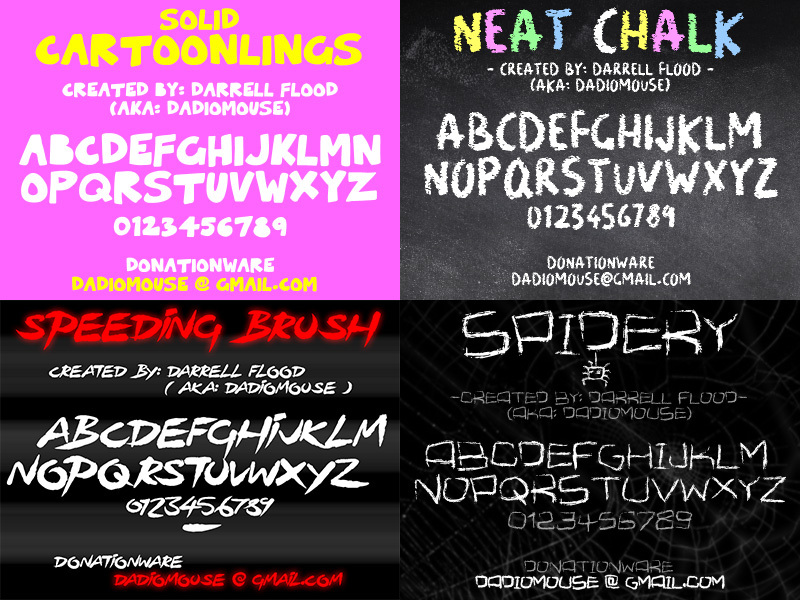 This month saw me create 4 new fonts. Grab ’em while they’re hot over on dafont. 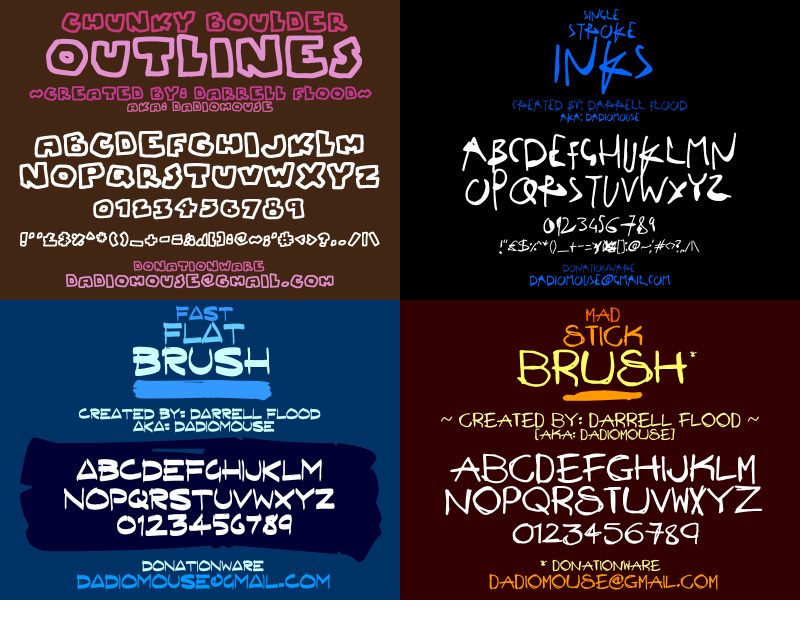 Another outline font today, this time with a thicker 3D look and with more refined characters. This one also has shadow scribbles running through each characters “depth”. I felt that the font lent itself well to being drawn with chalk, so ran with colored chalk on chalkboard for the sample image. I spent most of today working out kinks in the “Dungeon” generation and ensuring each dungeon feels interesting, with unique features every time. In Cowgirls vs Cthonimon, the “dungeons” are technically either Mines or Caves, tho functionally they are the same as dungeons in any action RPG. It is here where the player must go to defeat Bosses, rescue people, sort out bandits and get the best loot (and all important progression items). 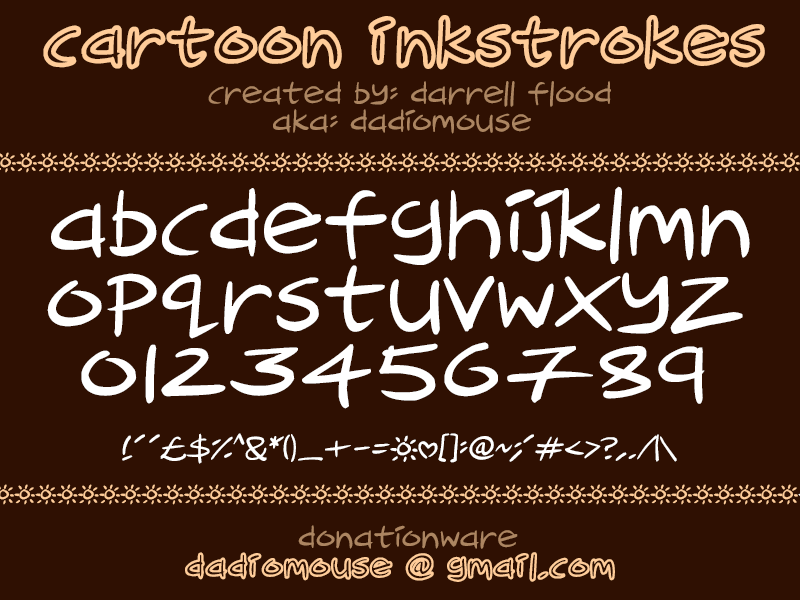 I also completed the hollow version of the Cartoon Instrokes font and revamped it’s sample image. Use “regular” for solid & “bold” for hollow/outline. Today’s focus has been on further developing content for the “Overworld” section of Cowgirls Vs Cthonimon. Though you can hop from planet to planet during your adventure, it is important to me that each world can stand on it’s own and make sense in and of itself. My primary concern here is to avoid anything that feels “just random” – because worlds or sections that are entirely (or almost entirely) random tend to feel chaotic and lead to boredom and/or a sense of repetition or pointlessness as you play. So, I have a lot of rules going on behind the scenes that determine placement of area locks and keys, dungeon entrances, mission NPCs and progression items that I am tweaking. Everything rests on those core elements, so I’m doing everything I can to get those feeling as natural and as “designed by hand” as possible at the moment.